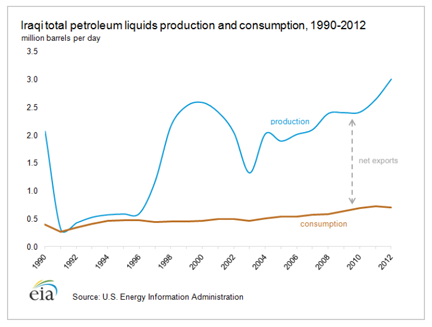 There is often quite a debate in the Peak Oil community over the difference between a reserve and a resource. Simplistically a resource is the amount of, for the sake of discussion, oil that is in the ground in a certain country, while the reserve is the amount of oil that can be both technically and economically recovered from that resource. The numbers can differ quite markedly, and the judgment as to whether a certain body is a reserve is finally made when a well is drilled down, and production (or not) begins. 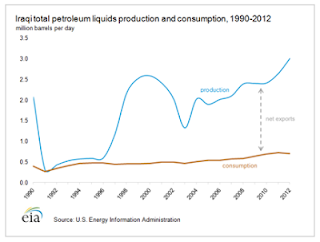 Just having the reserve available is not, however, within the global discussion of Peak Oil, an adequate sufficiency. Because oil well flow declines over time it is important that the rate of oil production from that reservoir, and the timeliness of its arrival within the supply chain be considered. This is particularly true in discussions over the help that the reserve will provide in ensuring that there is an adequate supply available when the global demand needs it. Normally, as noted, the decisions on production are made on geologic and economic grounds, but it would be foolish not to recognize that there are other factors. Consider the case of Iraq. It is common to find the assumption that Iraqi oil production will rise considerably, with some suggesting it will reach the levels currently only achieved by Russia and Saudi Arabia, although there are some who project it might even rise to as much as 13 mbd, given that there are contracts in place, which if all were fulfilled on time, would raise Iraqi production four-fold to 12 mbd by 2017. In their Special Report on Iraq last year the IEA noted that the country is already the world’s third-largest oil exporter, with the potential and intent to increase production much further. And, as the EIA notes, Iraq became the second largest oil producer in OPEC, when it passed Iran at the end of last year. Iraq is currently producing around 3.1 mbd of crude and thus the potential production levels, and their contribution to reserves and to the daily global need for supply, still has a way to go. With so much oil potentially available, and yet with considerable question over the rate at which it will arrive, it is worth examining the conclusions that the IEA came to, before the current increase in violence occurred. This new spate of attacks come after an interval when violence was decreasing in the country, and may prove a further impediment to significant growth in production. The IEA built three different scenarios in their report, for which their was extensive consultation in country. The main or Central Scenario that they project anticipates that GDP in the country will continue to rise, though tapering off as stability are achieved in the out years. The Iraqi GDP grew 10.2% last year, and has been growing at an increasing rate over the past few years. The oil fields in the country are largely concentrated in two separate regions, down around Basra in the south of the country, and in the region around Kirkuk and Mosul in the North. Figure 5. 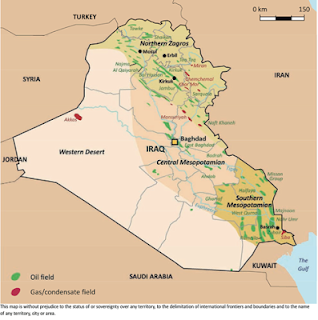 Oil and gas fields in Iraq (IEA ). This division is somewhat unfortunate from a politically stable point of view since the region in the south is predominantly Shiite, while the reserves in the north lie in the Kurdish region of the country. There is significantly less within the Sunni communities which are largely found in the central region of the country. In recent times Euan Mearns has written of the potential for oil production in the Kurdish region in the north. In total this is estimated to hold around 4 billion barrels of oil, or around 17% of the national reserve. However, as exploration of the potential fields in Kurdistan continues, this estimate has been increased by the local government to a possible 45 billion barrels. Euan, for example, wrote about the development of the Shaikan oil field and the potential size of between 8 and 13.4 billion barrels that it showed in January 2012. Current plans are for production to reach 40,000 bpd “soon”, with production ramping up to 400,000 bpd. The Kurdistan Regional Government (KRG) see it playing a considerable role in achieving their target of 400 kbd this year, 1 mbd by 2015, and 2 mbd by 2019. The field is being developed by Gulf Keystone Petroleum. In the south current production is centered around the Rumaila oil fields. 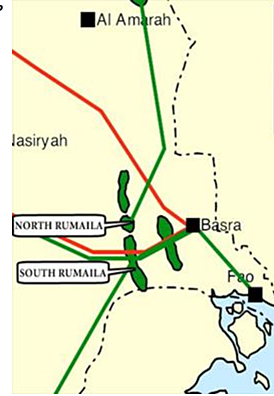 BP has committed $2.85 billion toward improvements in Rumaila this year, with the intent of raising production from the current 1.4 mbd, through 1.45 mbd at the end of this year, up to 6 mbd by 2017. 300 new wells will be drilled in the field over the next five years, to meet the goal, with 150 of these being drilled in the second half of this year. BP operates the field in partnership with CNPC. The overall scale of Chinese involvement is of concern to some, since as oil supplies tighten in the years to come, it is expected that up to 80% of future Iraqi production will head towards Asia, and particularly to China. With the growing development of the Majnoon field, with an estimated reserve of 38 billion barrels, it might thus appear that the country is well on its way to meeting the projections that the contracts might suggest. However there are many constraints on future production, including infrastructure and water availability, and I will discuss these and why they limit the IEA to an optimistic assessment that the country will produce 6 mbd by 2020, and only reach 8.3 mbd by 2035 in the next post. Iraq aims to ramp up oil production by nearly 45 percent by the end of next year — without any input from its autonomous Kurdistan region — which suggests a lasting compromise in their long-running oil feud may be a way off. I suggest using it as a door stop and investing in a new machine. You can find a Brother or Singer at a big box store where prices start at around $60.00.